Speak with some of the members of the Thieves Guild and pick up your gear. Receive your Guild Armor from Tonilia. Soon after Mercer has agreed to let you into the Guild, Brynjolf will instruct you to talk to Delvin Mallory and Vex to learn more about the Guild and to Tonilia to get yourself equipped. Vex isn't the friendliest of types, but she will warm to you if you demonstrate some backbone and stand up to her browbeating. She'll make it clear she expects you to follow orders and warns you that being a thief isn't easy at all. She'll also be very honest with you: the Guild isn't doing great. She brushes it off as simple bad luck and mocks Delvin for thinking some sort of curse is to blame. Unlike Vex, Delvin will talk you down if you try to be smug around him. He will also prompt you to take on extra jobs because he too admits the Guild isn't what it used to be. He thinks someone is very upset with the Guild and has cursed it with misfortune. However, he doesn't plan on sulking and tells you he's going to spit in the curse's face and turn things around. Your last stop is Tonilia, Delvin's personal lookout. She won't be impressed if you try to act tough, but she'll nonetheless provide you with a full set of Thieves Guild armor. 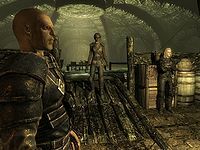 200 Finishes quest After speaking with Delvin Mallory and Vex, I've determined that the Thieves Guild appears to be in decline but neither of them seem to agree why. I should check in with them from time-to-time and undertake some of the extra jobs they offer in order to help get the Guild back on its feet and put some coin in my pocket. The following empty quest stages were omitted from the table: 0, 20, 30, 40. On the PC, it is possible to use the console to advance through the quest by entering setstage TG02B stage, where stage is the number of the stage you wish to complete. It is not possible to un-complete (i.e. go back) quest stages, but it is possible to clear all stages of the quest using resetquest TG02B. This page was last modified on 16 June 2014, at 21:47.